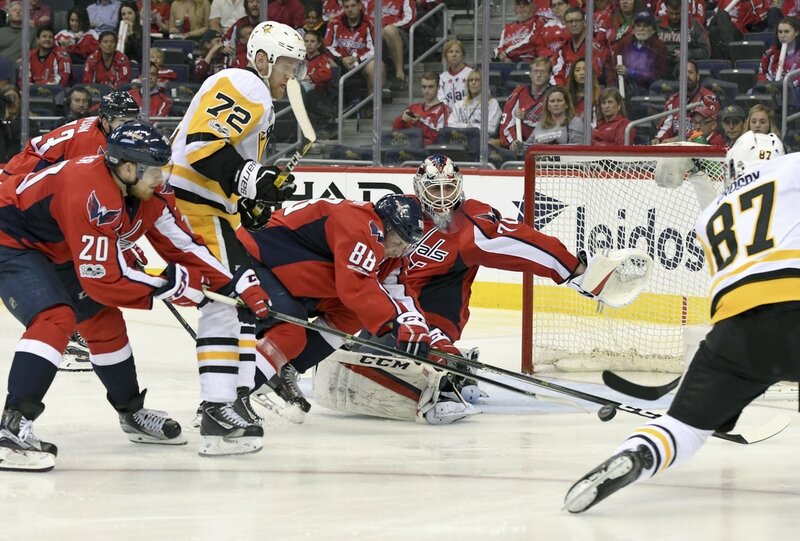 SCORED BY SIDNEY CROSBY on april 27, 2017 at washington. the goals were crosby's third and fourth of the 2017 playoffs and 52nd & 53rd career playoff goals. This puck was scored by Sidney Crosby at 10:46 of the second period of the March 31, 2017 game as the Pittsburgh Penguins faced the New York Rangers at Madison Square Garden. The goal was Crosby's 43rd of the 2016-17 season and 382nd of his career. The even-strength goal was assisted by Conor Sheary and Ron Hainsey. The Penguins won the game 4-3 in a shootout with Crosby scoring the shootout-clinching goal past Henrik Lundqvist. The puck was acquired by PenguinsChronicles.com ​​from The MeiGray Group on June 9, 2017. The puck was part of the Washington Capitals-MeiGray Group Game Used Authentication Program. A Letter of Authenticity signed by Shawn Tilger, Senior Vice President Business Operations of the Philadelphia Flyers, and Barry Meisel, President & Chief Operating Officer of The MeiGray Group, was included with the puck.